This has been an amazing first week of spring. The first day wasn't very promising, but after that things warmed up and even got sunny. We took 997 out of her hangar at Bellingham Airport for some landing practice around the patch. Base leg let us see Mt. Baker in the distance capped by a wispy cloud. Wayne and I took our 2452 Bayliner from Squalicum Harbor in Bellingham to visit friends with a place in Anacortes, Washington. The trip takes about the same amount of time by car or boat, but taking the boat is a whole lot more fun. We met them at the Cap Sante Marina where Wayne and I have overnighted before. It's a fun place with a mix of pleasure and commercial boats. Because it's the off season, we were given a prime spot in the commercial section. Near us was the Sydney Ann, an impressive commercial fishing boat with her net boat stowed on the aft deck ready to go. I looked her up on the U.S. Coast Guard vessel search website as well as the NOAA Fisheries Vessel Documentation website. Both are great resources where you can search for boats by name. The Sydney Ann is 44.2 feet in length and 14.9 feet wide. She was made by Alaska Marine Industries and has a fiberglass hull. 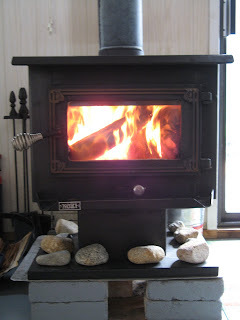 Earlier I shared the wood stove that's the "heart" of our float cabin home. Without its warmth, we couldn't live here in all seasons. Our stove is a KOZI. 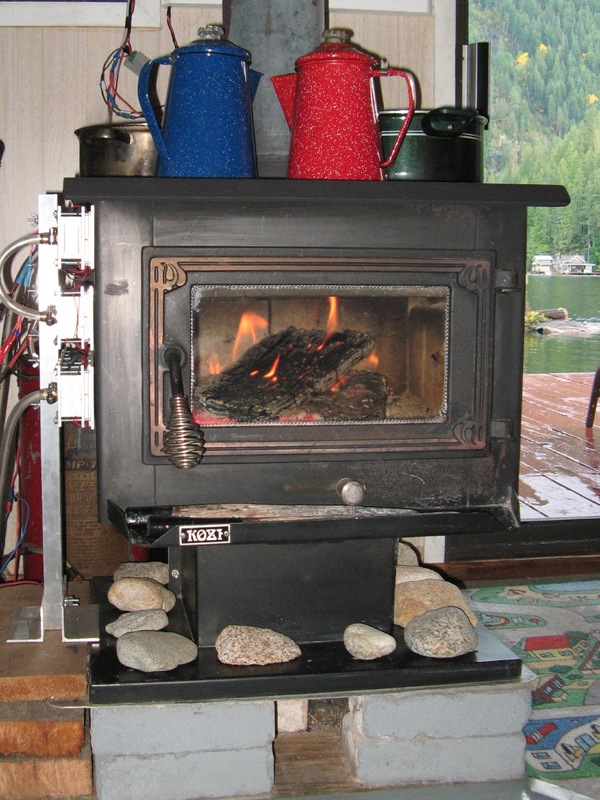 KOZI still makes wood and pellet stoves, but our model is what I lovingly call a classic. John (you met him last week for the letter "J") found our stove used and refurbished it before installing it in the cabin that would later become ours. I don't know for sure, but I surmise that the KOZI company chose their name because of how you feel when you cozy up to one of their stoves. Here's your chance. Hold out you hands and feel the warmth. Spring is finally here. The weather is a bit fickle, but the longer days let you know the world is changing. It's time to get my floating garden ready for the new season. First I picked the end of last year's crops. I leave things like carrots, kale, and chard in the ground. Even with freezing temperatures, they last better that way. The only thing I dared to plant this early was garlic bulbs I found at Canadian Tire (your tire store and more). For the last two years I've grown garlic in small pots on the transition float deck. I don't get a large crop, but plenty to last us for the following year. The last thing was to work up the soil and augment it with some steer manure and peat. Wayne helped me get it done just before another rainstorm moved through. Now everything can rest for a month. I'll begin my seed and seedling planting during my next visit in mid-April. When is a Bridge a Ladder? 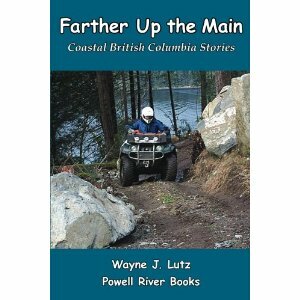 The ocean has tides, Powell Lake has cycles. High high water comes in July after spring rains and snow melt. October brings low low water after a long hot summer. Winter rains bring the lake back. Then in spring, the lake drops to a high low level because storms are less severe, and snow remains frozen in the high country. 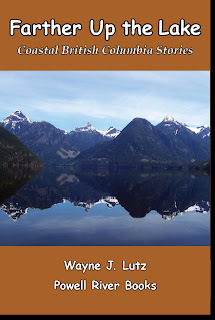 Lake level is determined by rain, snow melt, and runoff. After a heavy storm, it's not unusual to see it go up several inches. Lake level is also controlled by a dam built mainly to provide electricity for the papermill. This year the water's particularly low for early spring. More like October than March. We've had plenty of rain, so they must be releasing more water through the dam than usual. Our cabin rides in 80 feet of water. We're lucky. Some cabins go aground when the lake level drops too much. We can adjust our steel cables to shore, but our "stiff leg" log holding us away from the cliff is no longer floating. It's high, dry, and mighty stiff. There's nothing like heading home after a hectic day in town. We can travel in rain or shine, but shine is always more appealing to the eye. This morning we got back just at "sunrise." Because we're in the shadow of Goat Island, that doesn't happen until after 9:00 this time of year. Spring is in the air. Warmer weather brings out new green shoots, and hungry critters awakening from the winter doldrums. Last fall I cut back my rhubarb that grows in a pot on the transition float. I covered the crown with crumpled newspaper and extra soil. My goal was to help the roots survive freezing frosts. It's worked for two years. But when I got back to the cabin last month, a hungry critter had dug into the pot and removed the mulch. This particular critter must have been looking for grubs because the roots didn't seem to be damaged. I replaced the newspaper and soil and added a critter deterrent. Now all I have to do is hope that the rhubarb plant will sprout, and that I get back to the cabin before it reaches the top of it's new protective cage. What methods do you use to deter critters? His name may be John, but he's a Jack of All Trades. 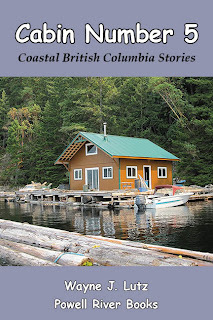 People who grow up here in Coastal BC are a self-sufficient sort. Isolation is one factor, independence is another. John learned to build float cabins by following traditional methods, seeking his father's advice, taking shop classes in high school, and building forts and mini-cabins as a kid with his brothers. John built our cabin in Hole in the Wall from the waterline up. 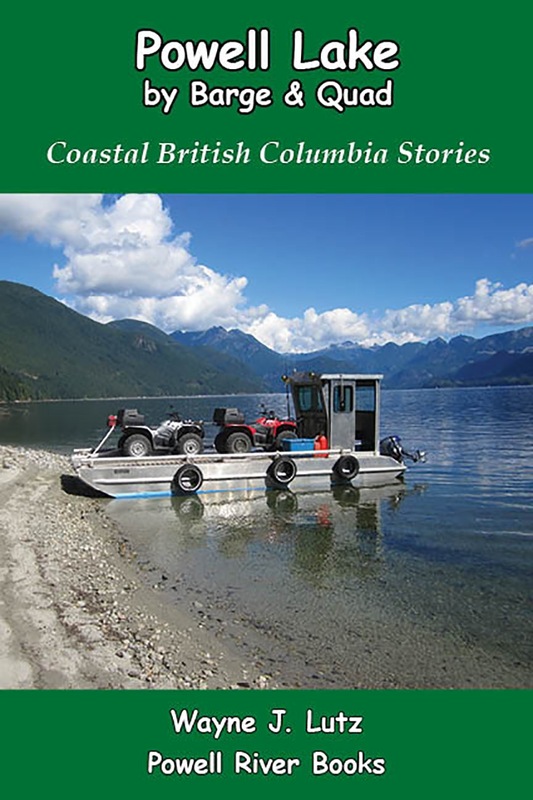 He got a cedar log float from a logging company, took it apart and rebuilt it better, stronger, not faster, but longer lasting. Sounds a bit like the creation of the bionic man doesn't it. John called ours Cabin #3 because it was his third. He's currently finishing Cabin #5. Installing a solar electrical system. 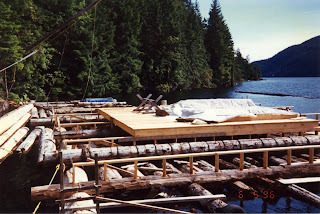 Constructing a floating wood shed. Making a cedar log raft for hauling stuff. Installing a wood stove wind cap. Putting extra flotation barrels under the float. Constructing a bathroom and porch addition. Making custom furniture to fit small spaces. Replacing steel cable anchors to shore. I just love the movie Captain Ron. If you love boats and haven't seen it, you're missing a classic. There's a line from the shower scene that reminds me how wet a boat can get. Captain Ron: "It's a lot of water... Well, it's a boat." Winter up the lake can be moist. Our Bayliner 2350 with an enclosed cabin needs help to stay dry inside. We use a variety of strategies to keep it dry and reduce the proliferation of mildew. Before heavy rains begin, we remove the cushions from the V-berth. We install Dri-Z-Air dehumidifiers in the empty berth to help absorb moisture. We also place others in other strategic locations. After the pellets dissolve, the liquid is emptied and the units refreshed to continue drawing moisture out of the air. We also use our solar power to run a Davis Instruments Air-Dryr 500 on a timer. When in operation, it sits safely in the middle of the boat's floor. This dehumidifier is good for off-the-grid since it only draws 0.6 amps while handling 500 square feet. And when we're using the boat, or running the engine at the dock, we use the built-in diesel heater to warm the cabin. To help distribute the warmth throughout the boat's cabin, we have attached a flexible duct hose. As we cruise on the lake, we move the warm air around the boat. If you use a fireplace or woodstove, you know that creosote is the dangerous buildup of smoke and vapor residue in the chimney. If you burn a hot, fast fire, combustion is more complete and creosote buildup is less likely. It's when you close down the flue to let the fire burn low and slow that creosote builds up quickly. When the temperature within the chimney gets below 121 degrees Celsius (250 F), the gases liquify to form creosote. My Imperial Magnetic Stove Thermometer helps me monitor and control this. We notice that liquid creosote production is more pronounced when the temperature drops below freezing. This super cools the outside portion of the chimney. The morning after a particularly clear and cold night, we went outside to discover liquid creosote crud all over our picnic table. It dripped down through the vertical chimney pipe, out the clean-out hatch at the bottom, and onto the metal porch roof. Because our roofing was recycled, it dripped through empty screw holes and right down onto the picnic table underneath. Liquid creosote is greasy, dark, thick, and has a strong burned odour. After a hot fire the next day, the liquid creosote dried up. But that is also a dangerous condition. Every other month Wayne goes up on the roof to thoroughly clean any creosote out of the chimney pipe. Once a year we remove the inside portion to do the same. Neither rain, nor snow, nor hail, nor cloud keep John from his appointed rounds (so to speak). The only thing that keeps him down the lake and in town are high winds. Our cabin is in a protected area called Hole in the Wall. Neighboring First Narrows seems to generate its own weather system and scuttering clouds. 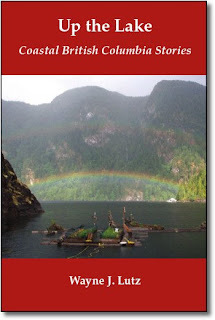 But to the south is a section of Powell Lake that John "lovingly" refers to as the North Sea. Can you guess why? If the winds aren't building three foot waves on the southern part of the lake, we can expect company if there's a job to be done. John's a good friend who we can always count on. This week I'm taking you back to one of my favourite working harbours, Steveston BC. 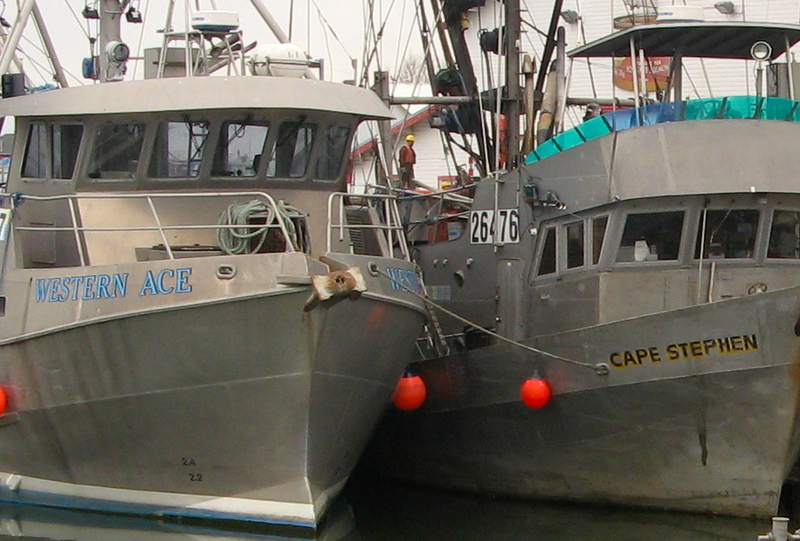 Just outside the Gulf of Georgia Cannery National Historic Site, two very active fishing boats were rafted up to each other to save limited dock space. 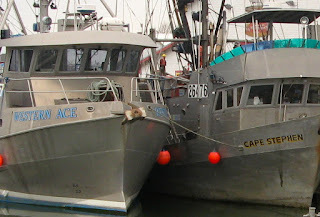 One was the Western Ace and the other was the Cape Stephen. 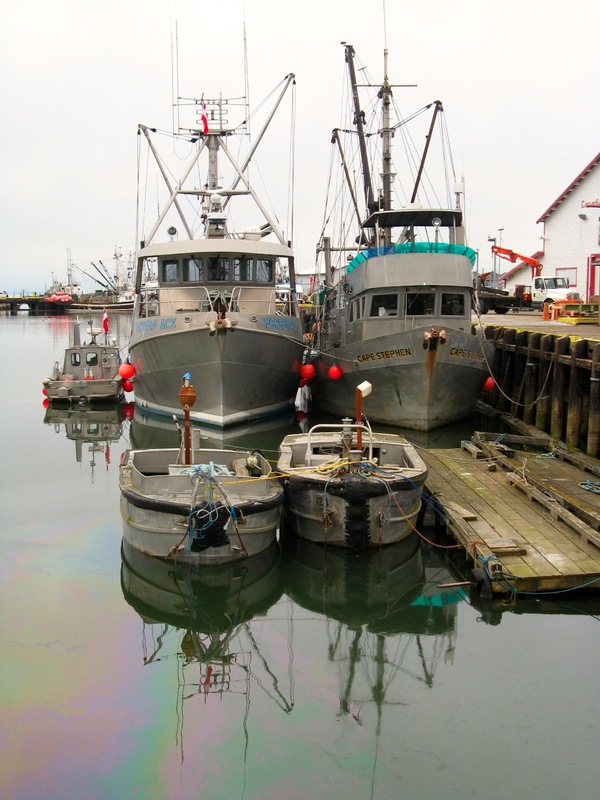 In front of them are two net boats, also rafted up to save dock space. The Western Ace was built by the Western Boat Builders Corporation of Tacoma, WA. She's a 170 foot tuna clipper built in 1950. The Cape Stephen was built in 1973 by the Matsumoto Shipyard in North Vancouver in 1973 as a 63 gross ton fishing vessel. She's now owned by Pattison Enterprises (surprise, surprise). I couldn't get a good angle to check on the length. She's also a study looking fishing boat. I purchased an Imperial Magnetic Stove Thermometer at Valley Building Supplies in Powell River. This magnetic thermometer is designed to show safe operating temperatures to avoid creosote formation and overheating. During normal operations, I put in on the stovepipe to monitor the exhaust temperature. 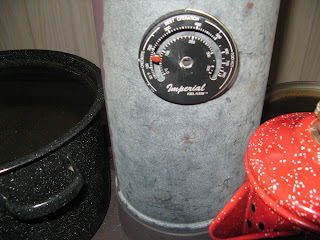 When we're using our woodstove thermoelectric generator, I put the Imperial thermometer on the side. The generator modules have an operational temperature range from about 250 to 325 degrees Celsius (482 to 617 degrees Fahrenheit). A fire that's too low won't generate electricity. One that's too hot will damage the power modules. 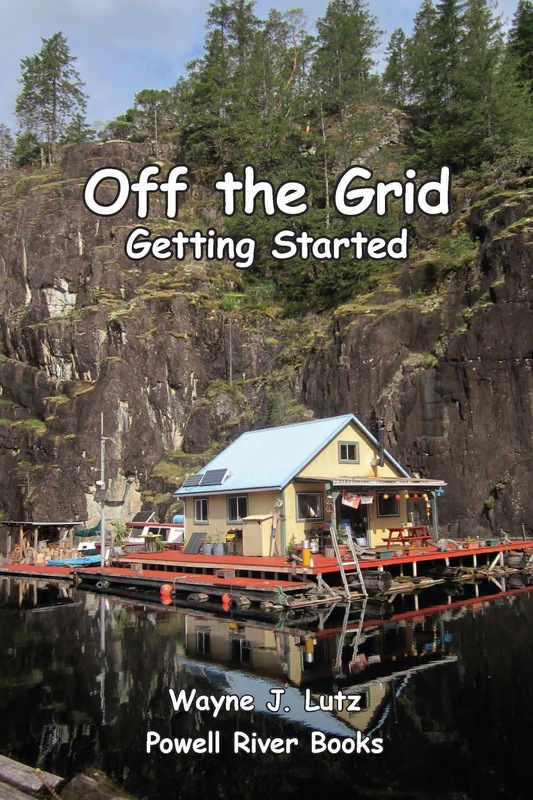 Our generator, cooled with lake water, produces a trickle charge for our cabin batteries during winter months when the solar panels aren't very productive. Boating at sunset on Bellingham Bay is always a beautiful experience. We just went out for a quick spin and saw a gorgeous sunset. It was a good thing we didn't plan to go far, or stay out too long. This time of year, our KOZI wood burning stove is the heart of our home. It came with the cabin and has been a steadfast friend ever since. With regular stovepipe cleaning, it keeps the fire roaring, or low and slow. 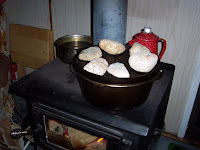 A woodstove must have wood. For us, that's fairly simple. During high water, the wood floats right to our front porch. All we have to do is scoop it up, cut it up (sometimes) and let it dry. When we are gathering wood throughout the summer, we are dreaming of the cozy fires it will bring during long winter nights. Storing wood on our cabin's float is problematic. We want it close, but not weighing down the foundation of our cabin. Our floating woodshed serves this purpose well. For those really rainy and windy nights, we have our small indoor wood shelf (click here for directions) that holds about 4-5 days worth of really dry wood. It takes up a little space in our "guest room," but no one seems to complain. Because we gather wood from debris floating on the lake, it comes in all sizes. When it's large, it must be cut and split. For twelve years we completed that task using a chain saw and ax. We still use the chainsaw to cut the pieces into stove lengths, but for Christmas I got an electric log splitter. What a wonderful device for both of us to use. In case you missed the video, here it is. Watch out for your fingers! Wayne and I spent an afternoon on the Apache Trail Scenic Drive while we were in Arizona. It was fairly close to Tempe where we were staying, and the sunny warm afternoon made for a great time to be outdoors. The road called Apache Trail starts in the town of Apache Junction. It travels through high desert with lots of cactus, including the impressive branching saguaro. The route was originally used by the Apache to get through the Superstition Mountains. It later became a stagecoach trail before an automobile road with grades and switchbacks. It must really been something to experience back in the day. We found a trailhead near the top of the pass with an old cattle pen. This time of year there's quite a bit of grass on the desert floor, so I guess you could run cattle in these mountains. But it would take a lot of land to sustain just one. We passed Canyon Lake with boats waiting for the season to start. Today sure felt like the right season to me. And the campgrounds and picnic areas in the Tonto National Forest weren't crowded. We drove as far as Tortilla Flat, a former stagecoach stop turned into a tourist area. For us this was the end of the road before turning around and returning the way we came. To continue, the road becomes dirt and we didn't want to try that is a rental car.